Update: Autumn Leaves was reworked in 8.1 and now adds a second to Rejuvenations duration. This article is largely outdated. Please check the 8.1 FAQ for more information on the revamp. Autumn Leaves is an azerite trait that increases our rejuvenation healing when it’s the only HoT on the target. . It’s a must-have in Uldir and you’ll want three of them ready to go for release week. You’ll eventually replace one with Archive of the Titans which offers a strong personal secondary stat buff through Reorigination Array while in Uldir. With the recent hotfix buff to Archive of the Titans it’s no longer a hard requirement to run 2 AL + 1 Archive like it was before the change. Germination counts as a rejuvenation and will proc the trait if alone on a target. If the ally has Germination at the same time as a regular Rejuvenation, it counts as two HoTs and you won’t get Autumn Leaves. Non-resto specific HoTs also remove the bonus so you’ll want to avoid Concentrated Mending and Coastal Surge where possible. Concentrated Mending is still better than no trait at all when you’re given no choice. Autumn Leaves does scale with mastery as its an extension of Rejuvenation and single HoTs also benefit from the stat. Mastery is still slightly weaker than other secondary stats since it’s significantly more expensive per point and your average number of HoTs on each target will be low. Haste, Crit and Versatility remain just as good and Intellect is still best. Autumn Leaves is pretty awful in dungeons so you’ll need to keep separate sets for Mythic+ and raid if you’re aiming to do both competitively. It has a big impact on which talents are viable, and a smaller impact on our spell priorities. Both are covered below. AL is still very good if you’ve only managed to get one or two of them. You’ll want to use Twig It with raid logs to be certain but as a general rule you can drop 30-45 ilvl on a piece of gear to pick up Autumn Leaves – depending on the other traits on the piece and on the slot. Autumn Leaves is pretty bad in ten man raids. If you’re running smaller groups then go with other traits. You’ve heard some awful rumors about how we’re a one button spec with Autumn Leaves but the reality doesn’t quite match the reputation. If you were a little unlucky and only managed to grab one AL trait like me then you’ll cast Wild Growth whenever there are injured allies around – the same as if you had no Autumn Leaves traits. WG only falls behind Rejuv in efficiency when you have two or more. Rejuv becomes significantly more efficient than Wild Growth during Tree of Life but it’s still less healing per cast so if you need a burst of healing to keep the team alive then cast Wild Growth. It’s acceptable to let Lifebloom drop during Tree of Life if there isn’t a priority target that needs it. Analyze the fight! Where do you need more throughput, and where can you instead rely on the much more efficient Rejuvenation casts instead. You’ll avoid any talents that encourage extra HoTs, several of which aren’t really viable with or without Autumn Leaves. The ones is red are completely unviable with Autumn Leaves; the gold borders represents our standard raid build. Spring Blossoms is the most notable loss. Our traits are still definitely in need of some tuning. The playstyle is fine but Azerite traits are much more interesting when more than two of them are competitive. We have some pretty interesting traits like Rampant Growth and Lively Spirit that’ll see no competitive play while Autumn Leaves holds this much power. Use it as a goalpost and bring the other traits up to its level. Here’s a sample of the HPM / HPCT we’re looking at with Autumn Leaves. Your numbers will look a little different since they depend on your statline and average mastery stacks but it should give you a pretty good idea of how each spell compares. Wild Growth will have slightly worse HPM than this in practice because it’s likely to land on rejuv targets and eat Autumn Leaves healing but it heals more per cast in any case. AL numbers are based on 340ilvl Azerite pieces that we’ll be wearing into our first raids. @ warcraftlogs, most resto are using 2x Archive + Waking – is it > AL ? Or Is it also possible to go for 1x Archive 1x AL 1x Waking? If 1x 1x 1x each, then the other question is, if 1x archive > 1x AL ? If so, then 2x Archive + 1x Waking is better. It’s a little fight dependent. 3x Archive or 2x Archive 1x Waking Dream are much easier setups to use than Autumn Leaves and the extra flexibility in talent choices keeps them relevant on every fight. In the Grid settings go to General Settings -> Layouts and then hit Test. It’ll give you movable frames. Once you’re set click Test again to go back to normal. Is this AL build still viable? I have the 3 AL traits from Chest, Shoulder and Head Ilvl 340, but Recently looted the a 370 chest from raid in Ulduir, and seems the AL build has been nerfed somehow. Can you give a rough estimate of these from best to worse, ignoring ilvl? I have a 385 Headpiece w/ grove tending and a 340 AL one. Do i still use the 340? Are there any middle or inner traits in play? The 385 is stronger otherwise. voulk, can you provide evidence of your claim? i dont think the passive int from higher ilvl out performs autumn leaves. my personal experience in raids is that my (3) 340 autumn leaves out performs my (3) 370 non-autumn leaves. its roughly 500 int lost to take autumn leaves so i really hope they nerf it into the worst trait. its ridiculous that im forced into using 340 gear over 370. I read there was a stealth nerf to AL with the resto changes on the 11th. I only have one piece, but my AL healing pretty abysmal last night. Do you think it will be losing it’s place as our top trait, or was I just not utilizing it properly? What kind of numbers were you getting from it? It hasn’t been nerfed since the initial raid release and is still our strongest trait (though 370 Archive / Laser Matrix pieces can beat 340 Autumn Leaves). There’s a chance you weren’t quite maximising its potential. You should look at get about 3% healing per trait. i think autumn leaves depends entirely on your raid size. im 357 with (3) 340 AL traits. the first week our raid had 20 and AL did average 8%. this past week we had 16 and it was 5% or less. 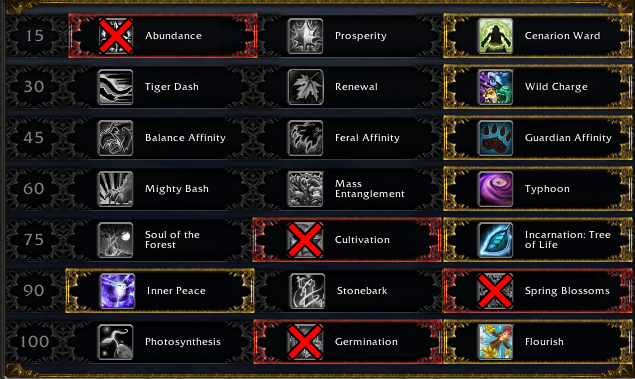 ill be using my higher ilvl pieces this week because i plan to use cultivation instead of tree and if it beats 5% then that will be my answer. i think that on paper autumn leaves works, but in practice we have so many different hots rolling that it just doesnt have enough up time, especially on smaller raids where wild growth is constantly over-writing AL and with tranquility being cast and flourished for 16 secs every 2 mins. I need some advice here mate. If i have 2 pieces with autumn leaves, 1 ysera’s and then i receive an uldir drop with +15ilvls but i would have to change out one of the AL pieces with laser matrix, meaning i would only have 1 piece with AL left. Is it worth it? if yes, would you still go the same CD talent build? It’s worth it because it’s your first Laser Matrix / Archive of the Titans piece so it unlocks the reorigination buff. You can run with the standard raid build even with 1x Autumn Leaves. To start, thanks for your guide, but I still have doubt about the efficiency. It sound idiot, but when you’re in raids, and you have +1 healing druids, if your target has already a rejuv from an another druid, will it cancel the AL proc, when you’ll apply your own rejuv ? I read “the only HoT on the target” in the introduction, that’s why I doubt. About dungeons, the main problem is we have to give up Germination over Flourrish, to make AL efficient. Most of the time, I need to maintain the double rejuv + Bloom + Efflo on tank, if I want him to survive. Hots cast by other resto druids don’t cancel any of your AL procs so no need to worry about that. In dungeons you don’t want to use Autumn Leaves. The smaller group size makes stacking hots a much stronger way of healing than dropping a rejuv and hoping for the best. Abundance is only good when Regrowth becomes more HPM than Rejuv – any less and it’s rarely worth the cast. With triple AL this just never happens. If you have seven rejuvs out you’re better off casting an eighth than a regrowth. Even more annoyingly the regrowth HoT actually heals for less than the Autumn Leaves bonus that you lose by casting Regrowth on the target so your regrowth target selection is highly limited. I know a trait that encourages so many Rejuvenations out seems good for Abundance but in practice it’s a heavy HPS loss. This is such a kick in the pants. We’re officially the most boring healer in the game. I’ve been enjoying raids quite a bit. Moving to a heavy emphasis on cooldowns means we have to plan out each fight in much more detail than the spammy “anything-goes” style of Antorus. Thank you for the resources you’re putting out there. I keep picking up something new from what you are writing. I’ve not raid healed in earnest since Wrath, so lots of (re) learning to do. This clicks with me and gives me a good start to start mastering my tree. a good way to do this is go check the heroic logs for each boss. filter it down to resto druids and see when the top druids are using tranquility and tree. it doesnt take long to make a quick reference guide for yourself and it will make your raid stand back in awe of your leet heals. Autumn Leaves – Effect decreased by 25%. Yeah. Accounted for in the article. It’s still our strongest trait so our hours of AL farming haven’t gone to waste. Is it still worth to grab much lower azerite armor pieces with AL? Yeah 325 + Autumn Leaves is still better than 340 non-AL pieces. 225 is a typo x( I’m sorry! My lower pieces are 325 ilvl. 3 Autumn Leaves 340 or 1 Archive of the Titans, 355 + 2 Autumn Leaves 340? Hi, how did you manage your stats with the 3 autumn leaves build? You can still mostly gear for ilvl with triple Autumn Leaves. Mastery ranks a little lower than the rest but you don’t want to give up much intellect to swap your stats around. Is there any resource on stacking traits? Waking Dream seems nice but icy-veins says stacking isnt that good. This seems to be out of date, or incorrect. On live my rejuv with 340 shoulders and NOT autumn leaves is healing for 1605 per tick, and when i swap that item for one with Autumn Leaves, it goes to 1616. This makes your HPC/HPM chart incorrect by quite a lot. That’s a common misconception but Autumn Leaves doesn’t actually work that way. It applies a second healing effect to the target that heals at the same time as Rejuvenation, instead of buffing the rejuv base heal. You can test this by applying a rejuv to yourself and taking a look through your combatlog. I’ll add it to the article. I noticed you pointed out woundbinders on the Pistoleer’s but not lifespeed was this intention or are the traits mentioned the ones you recommend taking? Just an oversight. Lifespeed is the stronger choice. Added. What are your thoughts on using Photosynthesis (with Lifebloom on ourselves for the 20% faster HoTs) for a more throughput and consistent blanket style raid healing with this trait? Or is this silly and Flourish should always be used since it would extend and empower the already powerful HoTs even though it’s bursty? Photosynthesis puts out pretty competitive healing now and can compete with Flourish from an HPS perspective if there’s persistent damage through the fight BUT this is often not the case and even when it is having an extra cooldown should still be too good to give up during progression. Let’s see what the damage patterns look like in Mythic but Flourish is definitely still the default pick.